German p2p lending service Smava.de launched two year ago. Since the launch of Smava 1350 loans were funded for a total loan volume of about 7.9 million Euro (approx. 10.7 million US$). So far lenders on Smava did well. There are approx. 2500 lenders active on Smava. Despite the credit crisis, 99% of the lenders earned a profit in 2008 (total 210,861 Euro), while the 1% who did incur a loss, lost only 60 Euro. So far ROI in the range from 5-10% have been realistic. As of today 75 loans have defaulted, which is (in percent) more then was originally predicted. The Anleger-Pool mechanism spreads the losses of a default across all loans of a credit grade, which prevents total losses of investments. Therefore when 3 in 100 loans in credit grade X default, the lenders invested in the defaulted loans still receive 97% of the principal, while for lenders in the current loans returns are lowered by 3%. Technically and on the process level Smava functions as promised. Provided the borrower has a credit grade of at least ‘H’ (95% of the German population have credit grades between ‘A’ and ‘H’ so about 5% are excluded) and he has a sufficient income, chances for obtaining a loan through Smava are good. About 60 percent of the listings were funded. 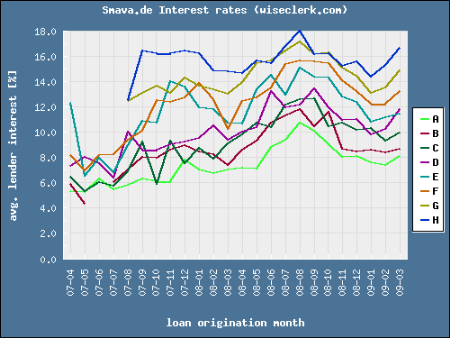 In February 2009 Smava raised the fees for borrowers from 1% to 2-2.5%. Despite extensive and positive press coverage Smava is still a niche market with less than 5000 active users. 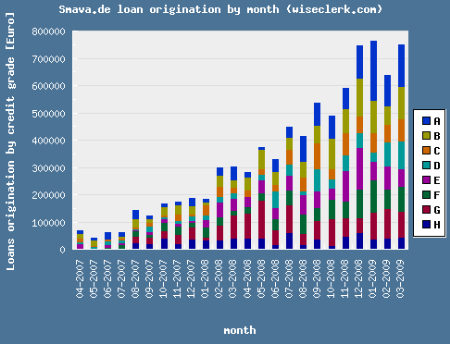 Looking at the distribution of lenders by amount invested, the top 50 Smava lenders funded about 1,690,000 Euro (or about 21% of total loan volume). Currently lenders are limited to a maximum of 100,000 Euro investment. I would estimate that the increased fees allow Smava to cover the variable costs. But to cover fixed operating expenses Smava needs to multiple its volume. First priority of Smava must be to accelerate growth.